Find out how we transformed the way Sunseeker Charters Poole do business online with a new website, email marketing & a web app too. Sunseeker Charters, based in Poole Dorset, contacted us to revamp their dated WordPress website and recreate it from the ground up using our bespoke approach. As the project progressed we also recognised further needs for a web application to let their customers manage their charter holiday online and a Sunseeker Broker portal to let staff see yacht availability. We created an immersive homepage design that really lets the yachts do the talking. The edge to edge nature of the design is really bold and looks great on tablets and mobile phones too. This site is all about the yachts, so we designed detail pages for each yacht in the Sunseeker fleet, complete with galleries, beautiful imagery and specifications. Sunseeker Charters needed to display the locations available to charter, so we created beautifully engaging location pages with breathtaking imagery that also show the yachts available to charter in that specific location. Everything about the new Sunseeker Charters website is content managed so new locations, yachts and news can be added with ease. 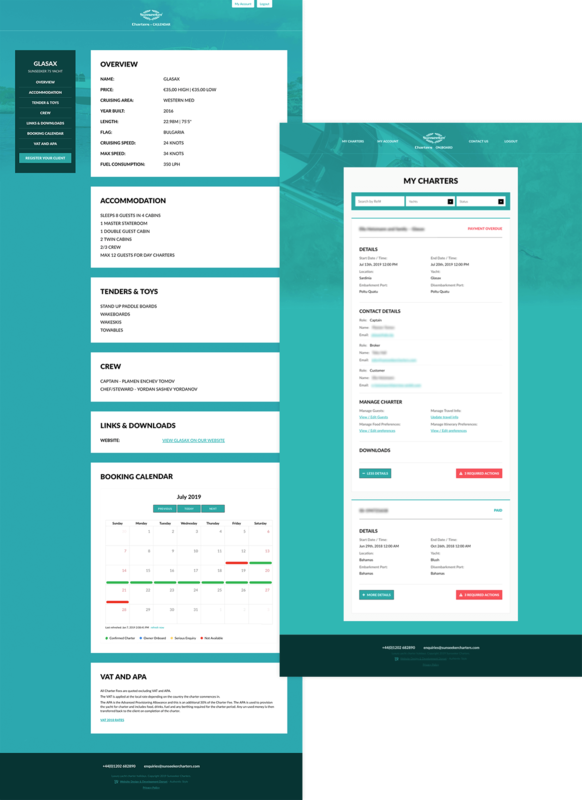 We also designed and built a secure web application called ONBOARD which provides customers with their own login to manage every aspect of their upcoming charter holiday. We also created another app called CALENDAR which shows Sunseeker brokers the availability of all yachts in their charter fleet. To complete things we designed and implemented a MailChimp email newsletter to match the new website. 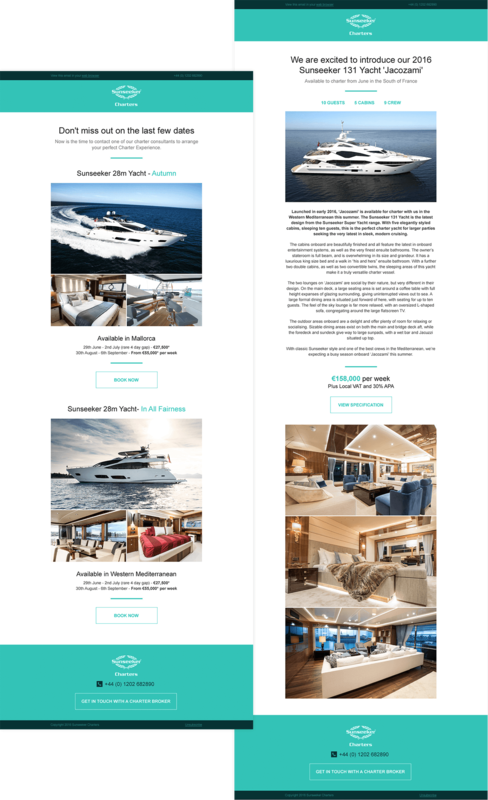 This email template allows Sunseeker to hide and show content and basically build their newsletter each month.